zeta on Kylo not necessary. gear 8 will do. the event is rather lite. I recommend his ZETA if you want to get 7 star BB-8 though and for the mythic. However the ZETA isn't recommended if your gonna shoot for 5 stars. Personal opinion of course but I disagree with a lot of this advice. The "best" FO team if you can define one, most people would agree uses FOST in place of FOTP, FOTP just hits hard and his kit is otherwise a bit dated. I.e. KRU, FOO, FOX, Kylo, FOST. The most sensible team to farm if you don't have any FO and only care about getting BB8 is KRU and FOX from cantina, FOO from Cantina store, Phasma from GW store and either one of FOTP or FOSFTP depending on if you want to use fleet store or guild store. FOSFTP is much more useful in the character side of the game FOTP is slightly more useful in the ships side. Also, as has been said, gear 8 and no zetas is plenty for this event if you use KRU lead. 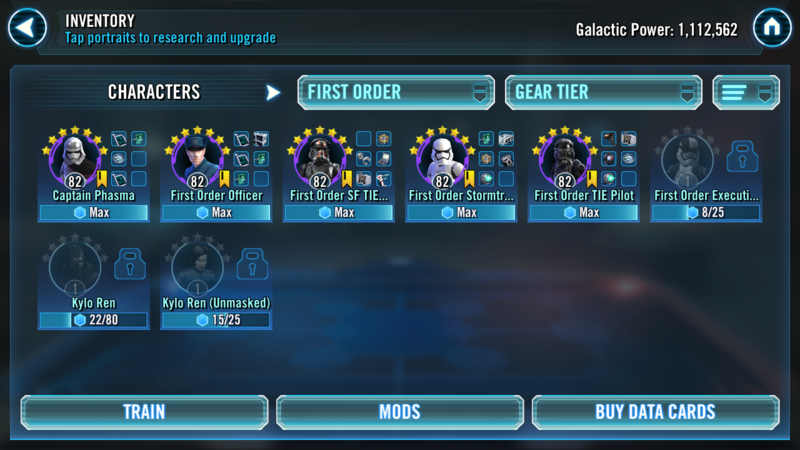 If you are concerned at all that your mods are not very good then gear 9 and no zeta will certainly still be enough. In general regarding FO zetas, OG Kylo's zeta is 4th priority and 100% a luxury zeta. The priority should be KRU's lead and if you read how much it does then that should be blatantly obvious. Completely changes the character of an FO team and provides them with the healing that actually make them useful in TB and TW. Second most important, FOST unique (assists assists and more assists). Third would be KRU unique, an expensive zeta for what you get, but useful for beating JTR teams in particular as it changes her opening move making the match a lot easier, also spreads a bit more ten down. If that's what you are using a zeta for we are certainly already in luxury territory. 4th most important is the one you suggest, Kylo's Outrage, an ability that you should hardly ever actually use when on offence and that the AI will hardly ever use on defence (the one thing that's right about the FO AI to be honest). Even if you do have to use it because the cooldown on lashout didn't get reset, all it does is give you a bit of protection regeneration which you don't need because you've got KRU's leadership continually topping you up anyway. If you want to do the mythic tier the FO squad is not the issue... it's the resistance squad you need in part 3 of the mythic event that's going to get wiped out before you've taken a turn. Yeah, that final tier of the mythic was a total nightmare. Thank Goodness I didn't have to have a funeral for my phone. BB-8’s mythic tier3 needs Resistance. Jedi-Training Rey makes that easier.